The 27th edition of the FACETS International Gem and Jewellery Exhibition began yesterday with a grand inauguration ceremony at the BMICH. Gracing the event as chief guest was Prime Minister Ranil Wickremesinghe, along with a number of members of Parliament, representatives of the diplomatic corps, members of the National Gem and Jewellery Authority and the Export Development Board as well as buyers and other special invitees. Among the invitees were many delegates from all over the world, all of whom were extremely impressed by the range and versatility of the exhibition. 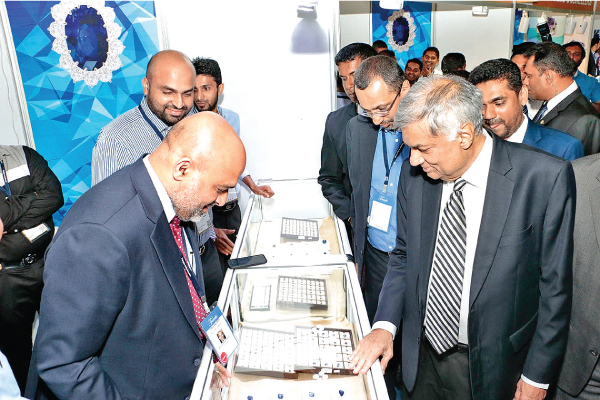 A number of stalls in the Sirimavo Bandaranaike Memorial Hall enjoyed a visit by the Prime Minister who expressed his admiration of the exquisite gemstones, the intricate jewellery and the laboratory equipment and tools used in the trade that are being showcased. The event was also graced by President Maithripala Sirisena later in the day. The collections on display are testimony to Sri Lanka’s immense reservoir of precious and semi-precious stones, the skill of its jewellery artisans and the country’s commitment to producing trend-setting designs. The exhibition is also made up of stalls featuring machinery, equipment, tools, laboratory and certification services and educational and training services, all of which play a vital role in the workings of the gem and jewellery industry of Sri Lanka. The FACETS organizing committee has introduced a special mobile app this year, which provides users with a list of the booth-holders, specific events, a layout of the booths, information about FACETS, the exhibition rules and regulations and a list of the members of the SLGJA. The FACETS app also comes with an online registration facility, thus ensuring that prospective visitors will be able to avoid the hassle of standing in line to gain passes. This year’s edition of FACETS holds something to suit every taste, with items available at reasonable prices to suit any budget.